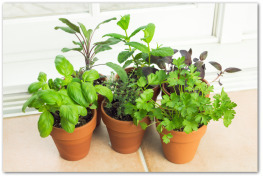 Use our tips for growing parsley in your backyard vegetable garden, or in a container garden! 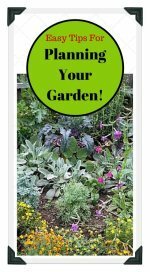 Learn how to plant parsley from seeds or transplants, and how to harvest parsley plants to extend the harvest. Advantages to planting parsley are the herb goes into the garden early and stays productive all season. This widely cultivated plant is a member of the carrot family. Its small compound leaves are used in cooking, and as a garnish. Seeds germinate in 11 to 28 days. To speed the process, soak seeds overnight, and then freeze for a week before planting. Additionally, you can rub the seeds between two sheets of sandpaper. 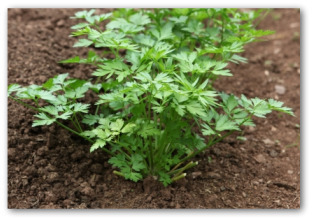 Parsley does best in a fertile, moist, sandy loam with good drainage. The pH range should be 6.0 to 8.0. The plant will tolerate some shade. Sows seeds directly in the garden about 2 to 4 weeks prior to the last spring frost. Plant seeds ¼ inch deep. For transplants, start seeds indoors or in a greenhouse 4 to 6 weeks before setting out, which can be done anytime from 4-6 weeks before to 4-6 weeks after the last expected frost date. Transplants can also be purchased from a local garden center in small containers. For intensive gardening, space plants 4 to 6 inches apart. Parsley can be grown from seeds or transplants in when container gardening. Parsley plants can be mixed with other herbs or vegetables in a large container, or planted as a single crop in smaller containers. The plants have deep root systems, so avoid using shallow pots when planting parsley. Parsley can be grown in full-sun, or light shade. In very hot climates, it is best to give the plants partial shade. Bothersome pests for the plants include cabbage loopers, aphids, and carrot rust flies. An inter-planting suggestion for parsley includes tucking this low-growing, shade-tolerant herb in-between taller growing crops. Another tip is to team parsley with celery, Brussels sprouts, and spinach for efficient use of space. Although not as sweet as the curly form, Flat Leaf is cited for its tremendous yield and suitable for most cooking purposes. Afro is a curly-leaved variety that holds very well in cold weather. Another curly-leaved variety Triple Curled is a reliable producer. Alternatively known as turnip rooted or Dutch parsley, this plant is suited to late finishes in the garden because it takes most of the season to mature. Once established, it can withstand cold temperatures. 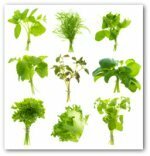 It differs from other growing parsley because it is used for its root as well as the leaves. The root resembles a parsnip's and is prepared similarly but tastes more like celeriac. As other parsley, Hamburg grows best in a temperature between 50 and 70 degrees. The plant's growth slows considerably if temperatures rise above 75 degrees or fall below 45. However, the hardy herb will survive freezing. The biennial plant bolts in warm weather in its second year. In regions with moderate winters sow the parsley in early spring. In extremely cold ones sow in July to over winter under mulch for a spring crop. This root needs a long season. March-sown Hamburg parsley is seldom harvested before late October. Hamburg parsley adapts well to most soils as long as they are moisture retentive and free of rocks and clods that will interfere with root development. The preferred pH level is between 6.0 and 7.0. 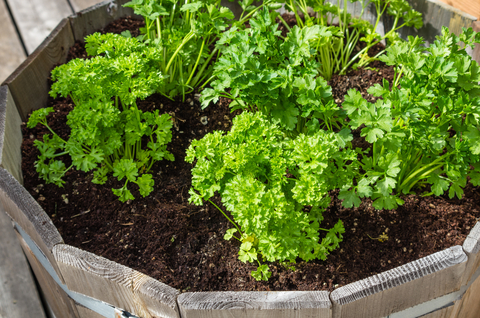 Keep growing parsley well-watered and mulched. As a bonus, few pest and disease problems seem to attack this type of parsley. Mulching growing parsley is an effective gardening technique to extend the harvest. Providing the herbs with mulch keeps them in harvestable shape into the winter. Potted parsley can be set in the garden during the growing season, and then moved indoors for an ongoing winter harvest. Parsley plants grow from the center of the plant outward. 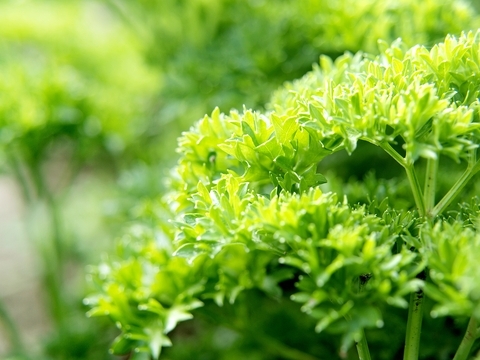 Once the parsley is established, cut a few sprigs at a time from the outside of the plant as desired. This cut-as-needed method keeps the plant producing for an entire season and beyond. It also helps shape the plant, by keeping it smaller and bushy as opposed to tall and lanky. 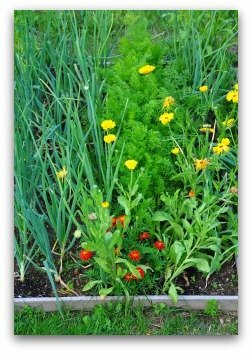 To extend the fresh herb harvest, try mulching the herbs several inches around their bases or provide them with winter frames, tunnels, or cloches. During the wintertime you can pick a few leaves at a time but do not disturb their dormancy by heavy picking.